Here’s everything water-related that I’m taking on the PCT. Obligatory. I think these are popular among thru-hikers because the tall, skinny shape allows you to easily reach them in your side pockets and return them. They’re also lightweight and easily replaceable, and the standard one-liter size makes it easy to plan your mileage and water carries. I’m planning on using one of my Smartwater bottles for clean water only and to mix my Amazing Grass. I’ll use my other one as a dirty water bottle and drink directly from it with my Sawyer Squeeze. A fun question to ask other hikers is what pun is printed on the inside of their bottle. I’m carrying a total of eight liters of water storage capacity. 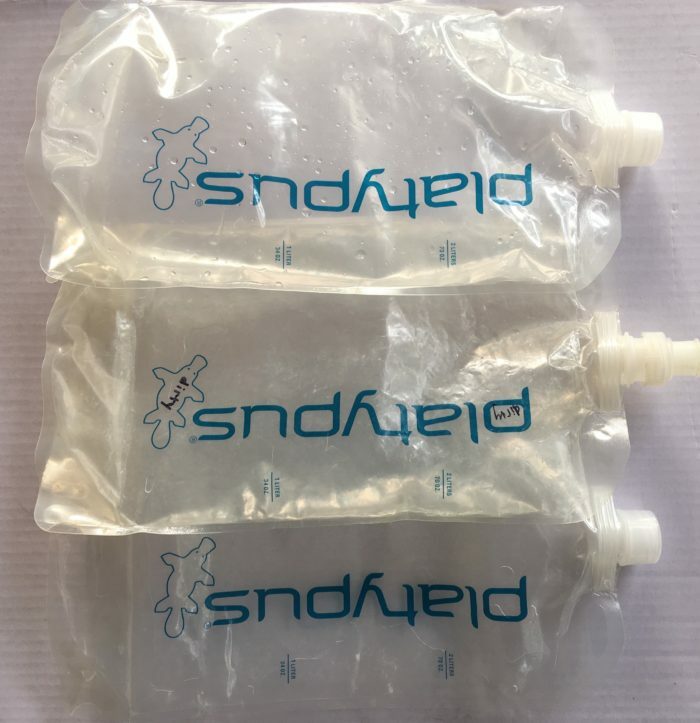 I’m planning on using my oldest one of these as my dirty water bladder. This is a new piece of gear for me. I was previously using the Platypus GravityWorks system, which was OK, but I wanted to cut down on bulk. On the CT I used a Katadyn BeFree, which I loved, but the soft bladder that came with it got a hole within the first 24 hours of using it. I ended up attaching it to a large Gatorade bottle that leaked a bit but performed OK for the short water carries on the CT. Katadyn should really make a solid water bottle for the BeFree — the flow rate is amazing. If anyone knows of a type of bottle that fits seamlessly with the BeFree, please let me know in the comments. The Squeeze has to be decent enough since that’s what most people use, but I hear the flow rate is terribly slow. 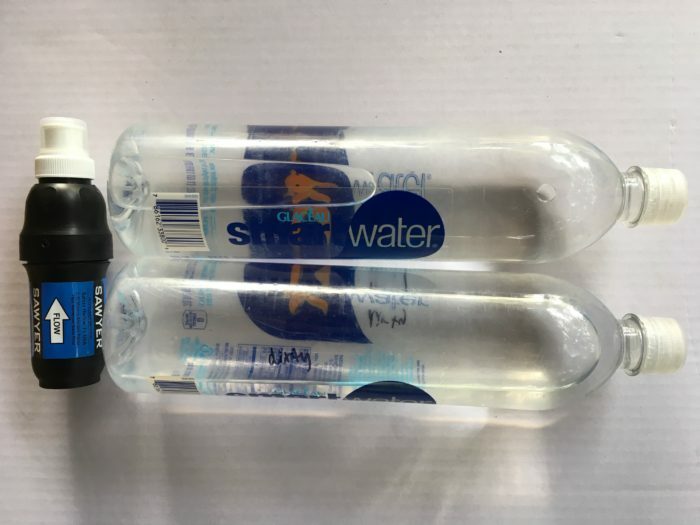 Smartwater bottles and the Platy bottles that I’m using can use the same lids. Always good to carry a couple extra. 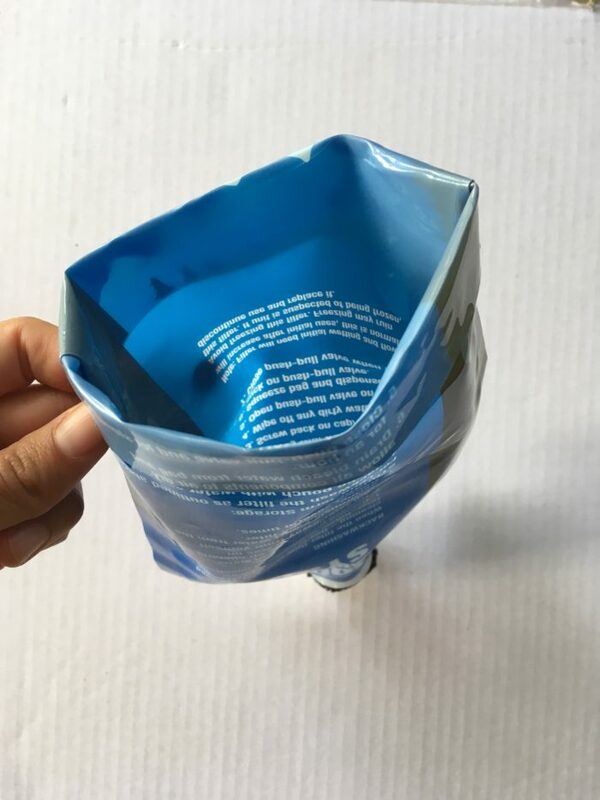 Water on the PCT will sometimes be from poorly flowing streams so I made a scoop out of a Sawyer Squeeze bladder by simply cutting off the bottom. I also turned it into a prefilter by placing a screen over the opening so I don’t clog up my actual filter on some of the more gross water sources. The BeFree bladder is actually made for Katadyn by HydraPak. 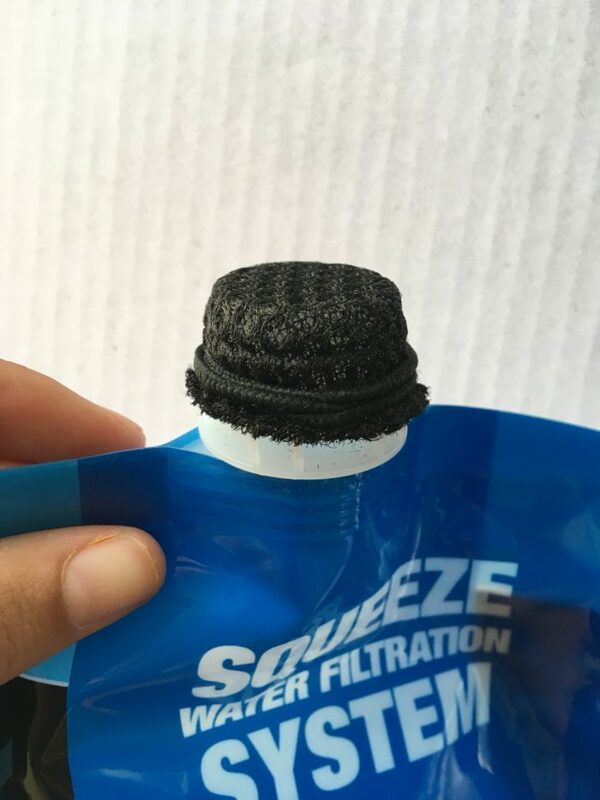 The filter will screw onto any of the HyrdraPak wide mouth bladders. I use the Seeker 2L. The wide mouth design is also much easier to fill from a stream than the Platypus bladders are. Hey Camacho, My BeFree also sprung a small leak on the 2nd day. And like Kyle, a also use the 2 liter Hydrapak at camp. For the sawyer, CNOC makes a Vecto water container that has a huge opening to fill- then attach your sawyer to filter. Great posts. How do you use the screen you put on your Sawyer bag to pre-filter?